Since phony, feckless, Jeff Flake has opted out of politics for the time being, Democrats have an excellent chance to pick up a Senate seat here in usually red Arizona in the 2018 midterms. Democrat Kyrsten Sinema, who has served the 9th Congressional district since 2014, is running for Senator against Republican Martha McSally, who has served the 2nd Congressional district. So at least Arizona will have it’s first female Senator. But as you’d expect from the modern day GOP, they are slinging mud like it’s a monster truck show. McSally has been relentless in her character assassination attack ads on local tv here, spewing forth volumes of lies and misleading claims on Sinema, forcing the Democratic candidate to play defense. Unfortunately, the ads seem to be working as Sinema’s lead since earlier this year, which was substantial, has slipped in the polls. Sinema has voted many times with Republicans over the past four years because she has to walk a political tightrope since many in her district are Republicans. But like her ads state, Sinema is truly an Independent like the majority of Arizonans are and will represent the state as it is now becoming; a purple state. But McSally is hardly a ramrod straight as she claims to be and she seems to be adopting a Trumpian manner in attacking Sinema and the Democrats. Sure, she impressively served as a pilot in the military (we truly applaud her record of service). But she had the nerve to attack Sinema for protesting the clusterf*ck that was the Iraq War and the quagmire that still is the Afghanistan war. And she’s claiming Sinema is protecting molesters and rapists, and would leave the border unprotected, which is downright lying and dirty politics, something Republicans claim to abhor. The only thing Sinema disagrees with McSally on border security is the necessity of a wall: McSally wants Trump’s stupid wall and Sinema wisely sees that its a waste of taxpayers money that won’t solve the problem (drones, tunnels, etc…). McSally also distanced herself from Trump after his election, but is now embracing the orange haired megalomaniac with open arms like other former moderate Trump-haters like Lindsey Graham and Susan Collins in the GOP. There is no doubt that McSally will be a rubber stamp for a man who is proudly ignorant and grossly dishonest as evidence by his recent 60 Minutes interview. If there’s anything we don’t need more of in this country, it’s Trump lackeys. It should be very interesting here in Arizona on election day. This state may not become blue, but it could become very purple November 6th which is more indicative of what this state is: Independent. 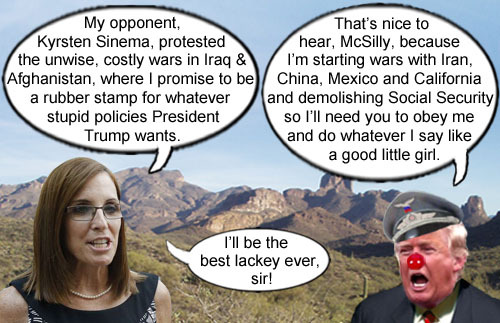 Arizona Republican candidate for Senator, Martha McSally, clarifies that she’ll be nothing more than a rubber stamp for any stupid, disastrous policy that springs forth from America’s CEO/Dictator, Donald Trump’s addled brain.